The last four months have seen tremendous app growth. Apple grew by 59k apps while Android added nearly 10k and Nokia added 5.5k apps to Ovi. As a percent, Palm grew the fastest with 1,352%, followed by Ovi with 827%. 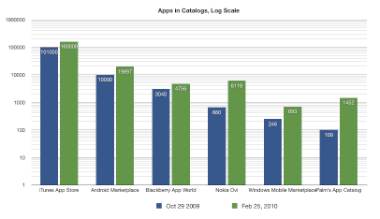 The slowest growing was actually Blackberry App World with a mere 56% growth. Finally, in terms of catalog ranking overall, Ovi climbed the league table to third spot behind Apple and Android and overtaking Blackberry App World. Palm overtook Windows Mobile Marketplace which is now dead last with 693 apps.